The parts running through the dedicated centerless grinding cell pictured in the video above are not arthroscopic shaver tubes, but they might as well be. Comparable in size, shape and material and adhering to the same stringent specifications as their real-world counterparts, these samples are ideal for demonstrating a process that can be adapted for virtually any arthroscopic shaver manufacturer. 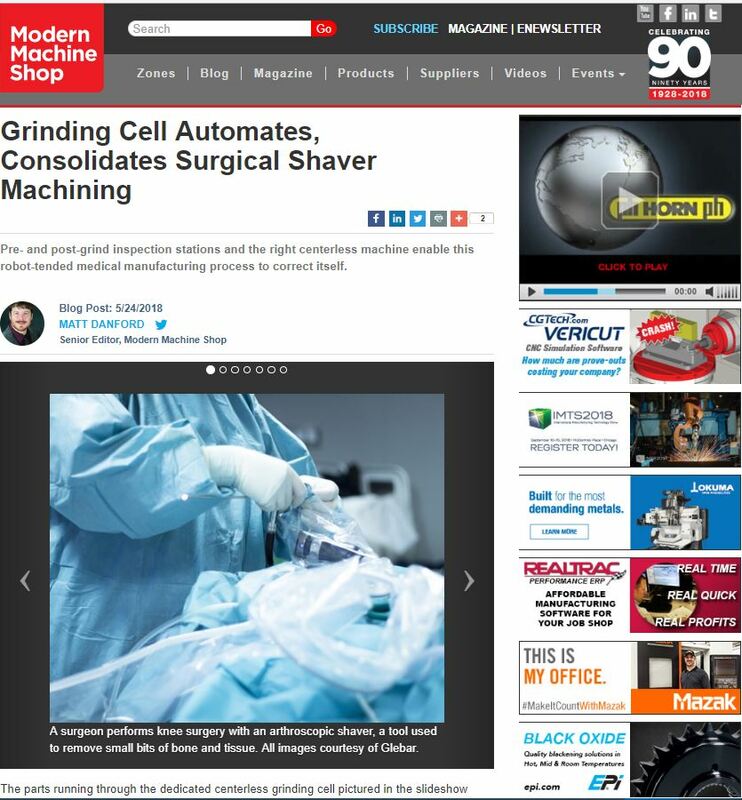 So says John Bannayan, president of turnkey grinding specialist Glebar, which developed the cell for medical manufacturers frustrated by multiple setups and quality issues. Leveraging a quality-data feedback loop, the auto-correcting, automated grinding process can churn out one of these 6- to 8-inch-long parts every 20 seconds, piece-to-piece. Available in various sizes and configurations, arthroscopic shavers generally consist of two stainless steel tubes, one fitting inside the other. As the inner tube spins, precisely formed cutting edges on one end shave small amounts of bone or tissue through a corresponding opening in the side of the outer tube. Ensuring debris flushes harmlessly away through the interior at speeds ranging to 10,000 rpm requires keeping the gap between the spinning inner and stationary outer tube as tight as 0.0005 inch. Outer tubes can be ground relatively easily and efficiently in a through-feed centerless process, in which the work passes through the machine’s grinding and regulating wheels and into a bin or other parts catcher. Inner tubes are less forgiving. With multiple tapering diameters and a rounded, attached tip, typically made from a harder material and including as many as 30 blended radii, these components must be placed onto and lifted from the work support as part of an in-feed grinding process.